This is my first Student Saturday. I am pleased to have a poem written by Joshua. His summer reading assignment included reading a book. 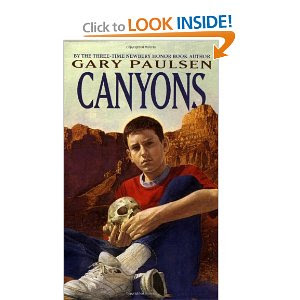 He chose the book, "Canyons" by Gary Paulsen. He informed me he had never had any training in writing poetry but he really felt like putting his heart into this and he did an awesome job. I went to the canyons and what did I see? Ran into trouble with a gun. But the boy could not understand. When I pulled it out of the ground I heard, “take me spirit”. Putting it where nobody else would see. I take the skull to my biology teacher, Mr. Homesley. I have to take him to where he was last. I’m putting the skull where it should be. Not caring about my family. My mother just called the cops. Knowing now I can’t make any stops. Telling me where he wants to be. But I did not stop until the skull was returned. I feel as though I have lost a friend. Great poem really enjoyed it.